It’s way more than just Skylines. Thanks to the 25-year rule, we Americans can only freely import foreign cars that are 25 years old or older, meaning every new year brings a new frenzy of youngtimer classics from Japan and Europe. We’re only a few days away from an entire new batch of importable cars, but how did our up-to-1992 year of 2017 go? Not bad, at least for all of you Jalopnik readers. There is more to imported cars than an endless parade of R32 Skylines. Not that an endless parade of R32 Skylines is a bad thing, but I just want to point out that you all have your importing sights set far and wide. BMW never sold the E30 wagon here in America (Because we Americans didn’t deserve it? What gives. ), but that’s nothing that can’t be solved now. Before it went, we got wonderful luxury cars like the first Lexus LS and also amazing niche microcars, like the gullwing-door, mid-engine kei car partnership between Mazda and Suzuki called the Autozam. It was one of a trio of kei sports cars, and reader Wampa has already moved on to number two of three. This is an interesting one, as it wasn’t a Bubble Era Japanese import into the U.S. and it wasn’t even an import into the U.S. at all. Reader I’d Rather Be Driving didn’t buy a car already imported into the United States, but rather imported a car with his brother. At least in this case, it all went remarkably smoothly. By contrast, reader OhAlbanianCar had an opposite experience, advising that going through an importer to handle all the paperwork isn’t a bad idea. This one wasn’t from 2017, but it goes to show that this whole importing thing, just like buying any car, isn’t guaranteed to be good, or guaranteed to be bad for that matter. I love the C33 Laurel and if I had the money, it’s maybe the car that I would import myself. That or a Mazda Luce with the turbo rotary and a five-speed from factory. Excuse me, I’m losing the point. Reader PureHate had yet another opposite experience, buying a never-sold-in-America sedan from a company that imports cars fully and then sells them to us Americans like any other classic car. But the lovely Laurel wasn’t exactly as expected. As ever, it was just like buying any other old car. This is one that I often think about as well. We got the S13-chassis Nissan here in America, but our cars came with lower-spec engines than were sold in Japan, and our 240s tend to be pretty beat up at this point. 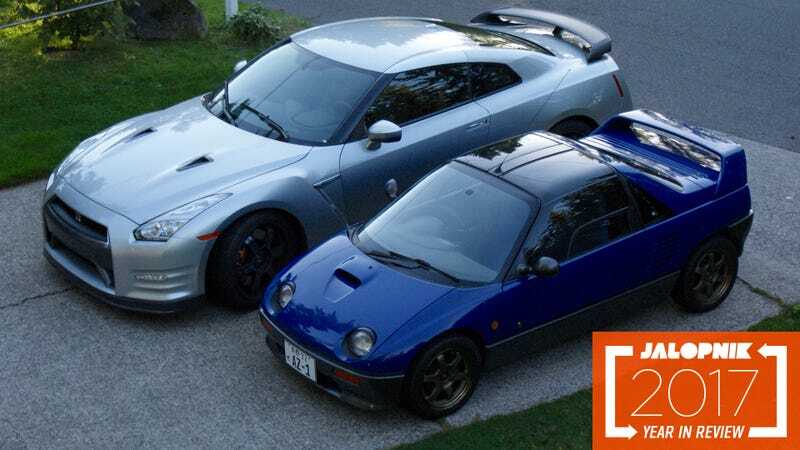 There are some lovely looking deals for well-preserved cars in Japan, but as reader TurboAllTheCars explains, even the nicest one can have its own little unexpected problems. I’ll also put in this sweet story from reader Sir HoonsAlot. We got this car as the Miata here, but there’s no reason not to want a nicely-kept example at a decent price, as you can often find in today’s import car market. This little blue roadster certainly seems to have worked out. And I have to end with our own Jason Torchinsky, who is getting his five-speed Nissan Pao today. As in, presently. He didn’t import the car but rather bought it from the wonderful Gary Duncan and his Duncan Imports warehouse/massive car collection. I am extremely jealous. If you’ve imported a car this past year and it wasn’t mentioned on the list, please comment below (with a picture of your car!) or email your story to tips at jalopnik dot com.